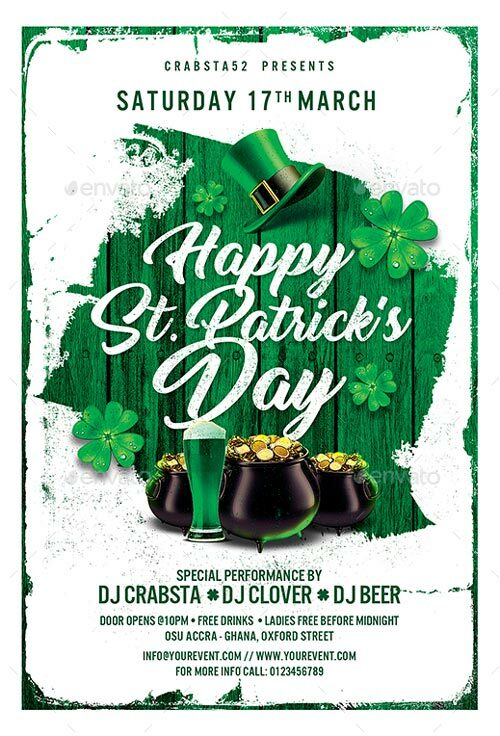 Enjoy downloading the Happy St. Patrick’s Day Flyer Template created by Crabsta52! The Happy St. Patrick’s Day Flyer Template was designed to promote your next St. Patrick’s Day Bar and Pub Event. This print ready premium flyer template includes a 300 dpi print ready CMYK file. All main elements are editable and customizable. You can edit the main text via text tool, the model image you can replace via smart object, right click edit smart object in your layer menu. The flyer is fully layered and organized to keep customization very simple! Super easy to edit, all well organized in folders with names, you can easily change Texts, Colors, Add/Remove objects to this layered PSD. Is very simple add your own image. All text can be edited. Happy St. Patrick’s Day Flyer Template is very modern psd flyer that will give the perfect promotion for your upcoming event or club parties! 1 PSD file 4×6” size with 0.25” bleeds Simple and easy to work with, RGB & CMYK versions included, 300dpi and Ready to print. Very well organized and layers named appropriately Easy photo, color and text replacement.